As a counterpoint to the Chilean pumpkin stew that was such a disappointment to me, I thought I would share something I found much more to my liking. I found this recipe for Bean Stew (Lubiya) in Habeeb Salloum's Classic Vegetarian Cooking from the Middle East & North Africa. I got a copy of the book years ago, leafed through it briefly, and stuck it on the shelf where I am sorry to say it has languished until a few years ago when I took it down and leafed through it so I could mark any recipes that interested me. I believe I tagged three out of the hundreds of recipes offered. Back on the shelf it went. Until a couple of weeks ago, when I was looking for something different to do with navy beans. I don't know why I decided to look there instead of the books I usually use. Perhaps that is specifically why I did decide to look there, now that I think about it. I was looking for something different. And I found it with this dish. 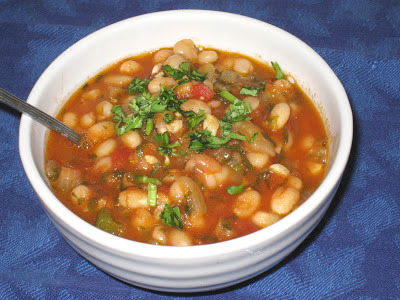 The flavors are clear and bright, with a flavor profile that is different from the usual bean dishes that I usually make. It made for a refreshing change that spiced up my lunch rotation. I will be making it again. And once I had the book down off the shelf again, I went through it to see if there were any other recipes that might appeal. I am pleased to report that there are now many tabs sticking up to mark recipes that I plan to try. A win-win situation all around, if you ask me. A note of interest (possibly only to me): when I did an online search for Lubiya I discovered that it is usually made with black-eyed peas, which a absolutely detest. Had the version in this book called for those instead of white beans, I would never have made it. Place the beans in a pot and cover with water by 2 inches over the beans. Bring the pot to boil, then lower the heat and cover. Simmer for 1-1/2 to 2 hours, until the beans are tender. Check periodically and add water as needed. While the beans are cooking, heat the oil over medium heat in a skillet and cook the onion for 10 minutes. Add the garlic, cilantro, and chili and saute for another 5 minutes. Add the onion mixture, tomatoes, and spices to the beans and bring it back to a boil. Lower the heat to medium and cook for another 30 minutes. Add the lemon juice and remove from the heat.